The Gardens at Coronation — Hush Homes Inc.
Everything blossoms in the garden. Discover a community that creates natural serenity in the heart of town, and find your own peaceful enclave. Join us for a stroll in the Gardens at Coronation. The homes of The Gardens provide the very best of location, design and town and country living. The secluded setting provides comfort and privacy, without sacrificing the convenience and excitement of city life. 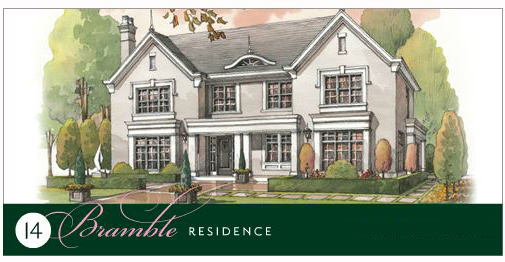 Architecturally, each home embraces the subtle sophistication of England, while incorporating modern innovation and custom touches that support unique lifestyles. Secluded by fully mature trees, the 14 thoughtfully placed lots, three of which will front on Belvedere, have frontages of up to 100 feet. Homes sizes vary from approximately 2,500 sq.ft. to over 4,000 sq.ft and provide many options for all. A short walk to the vast expanse of Coronation Park and the beautiful beach at the end of the road provide rich lifestyle environments for all. Interiors at The Gardens are customized to reflect the prestige of each residence. With HUSH’s signature attention to best-in-class detail nothing is overlooked. Spaces are designed to be dramatic, but still efficient, with effective use of every inch. From hardware finishes, to hand-made cabinetry, staircases and railings, to the physical definition of space, each home reflects what it is: A best-in-class experience, customized to the homeowner’s lifestyle and needs, and built to unsurpassed standards. The Gardens at Coronation is located in desirable south-west Oakville, between two harbours and close to Lake Ontario. The natural beauty of the region is complimented by numerous parks and trails, charming village areas, eating establishments to suit all tastes, recreational facilities, and many other conveniences. The Gardens is also just minutes from Oakville’s thriving downtown area, upscale retail shopping, and world-class educational institutions. For homeowners on the go, the town offers the convenience of commuter transit, and quick highway access to Toronto, Mississauga and the rest of the metro area. Nearby Bronte Village has been a flourishing community for over one hundred and fifty years. With its stunning harbour setting, the area has long been known as a haven for sailing enthusiasts, and has also been home to internationally-renowned writers and artists. Over the years, Bronte has provided a tranquil home for those looking for the ideal blend of convenience and culture. Bronte celebrates its history and uniqueness with innovative art galleries, summer outdoor theatre, horticultural activities, and a number of festivals. The charm and tranquility of the urban English garden has served as the inspiration for The Gardens at Coronation. Designed in a style that complements and enhances the surrounding community, these homes feature rich, natural tones, bold lines and lush foliage. Our unique and innovative designs provide the charm and natural elegance of an urban garden, with all the conveniences and amenities needed to nurture a variety of lifestyles. These English inspired homes were designed by HICKS partnership with functionality of the home in mind. However, these homes can be altered or fully customized to suit your needs. HUSH embraces the idea of creating grounds and gardens that reflect the spirit and stateliness of each home. Drawing inspiration from the thriving foliage of Provence, The Gardens provides colour, privacy and elegance with extensive landscaping. This includes mature trees and carefully-cultivated gardens designed to compliment The Gardens’s lakeside surroundings and provide exclusivity. Every lot has its own landscape plan, designed by professional landscape architects. Features will include cobbled walkways and sitting areas, complemented by shrubs, bushes and borders to create year-round texture and interest. HUSH’s optional landscaping enlarges the vision, adding ample colour in addition to lush greenery. Pathways become paving stones and bedding areas are expanded. With more trees, shrubs, and added flowering plants, the overall feel is that of manor-style grounds where pathways, waterscapes, shrubbery and seasonal blooms create a garden designed to engage the senses. Every lot has its own landscape plan designed by professional landscape architects. The Gardens home buyers also have the opportunity to customize their landscapes through one-on-one meetings with the landscape architect.